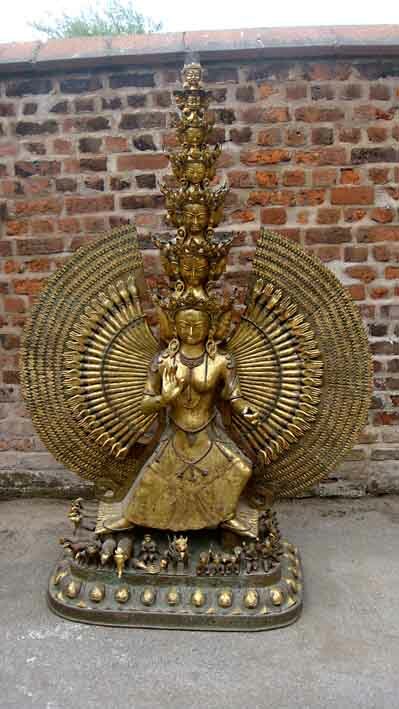 Cheshire saleroom Frank Marshall of Knutsford set a new house record when this massive 17th or 18th century Sino-Tibetan gilt bronze statue of Guanyin sold for £126,000. The 17th or 18th century Sino-Tibetan gilt bronze statue of Guanyin that sold for £126,000 at Cheshire saleroom Frank Marshall of Knutsford. The 6ft 6in (1.98m) high sculpture depicts the bodhisattva with 20 legs and a multi-tiered tower of 19 heads and 50 large mythical arms making a circle of a thousand arms. She rests upon lotus thrones surrounded by various worshipping animals, birds, reptiles, men and angels. Elements of the finely engraved stole were replacements, probably added in the 19th or early 20th century. The statue, catalogued for Frank Marshall by consultant Dr Eldon Worrall, was part of the Martin Heaps collection and formerly in the collection of a contemporary Manchester artist. It was one of many Sino-Tibetan objects in the sale purchased from the estate of the late P.S. McKay, a senior British diplomat posted in Tibet in the 1960s. The buyer at the July 16-17 sale, who was prepared to pay several times the £30,000-50,000 estimate, was described as a North West-based agent bidding on behalf of an Asian buyer. Marshall's previous house record was £70,000 for an Art Deco diamond necklace sold in November 2009.